As part of our feasibility study we commissioned Nourish Scotland to compare farm land trusts elsewhere in the world and Community Enterprise to consider legal, financial and governance options for Scottish Farm Land Trust. Read them both here. SFLT events in June, get involved! In April, we launched a survey to find out more about who is looking for land in Scotland. (It’s still open! See below). We’ve been astounded by the response to the survey, with over 1,200 filling it in. We clearly have a large contingent of passionate and dedicated people who would like to farm in Scotland, but are held back by the inaccessibility of land and prohibitive costs of starting a farm. In June, we will be holding meetings around Scotland. 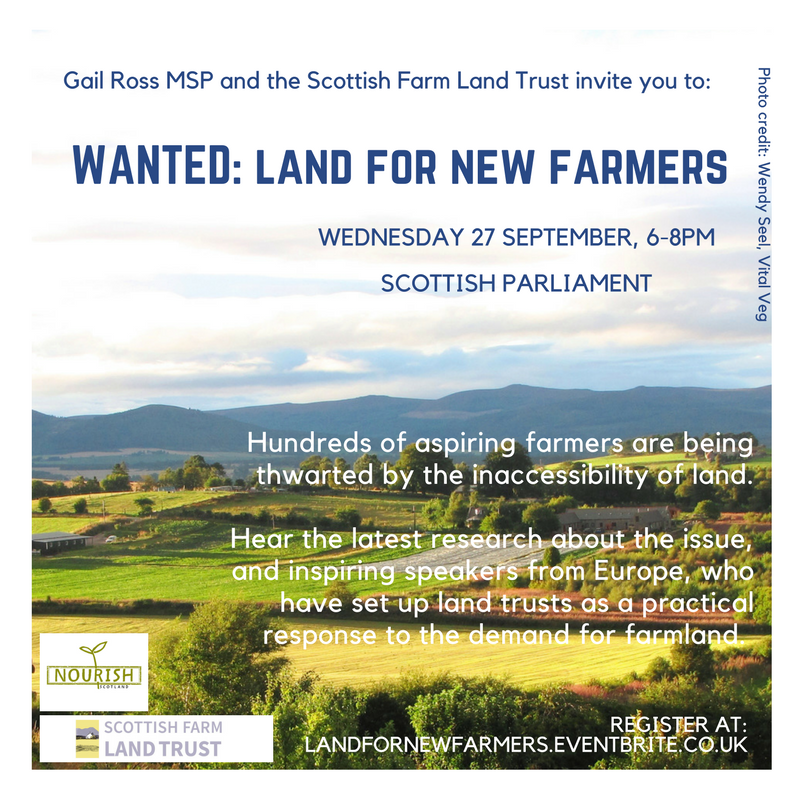 These events will be an opportunity to find out more about the Scottish Farm Land Trust, inform the development of the organisation, and get involved if you would like to. 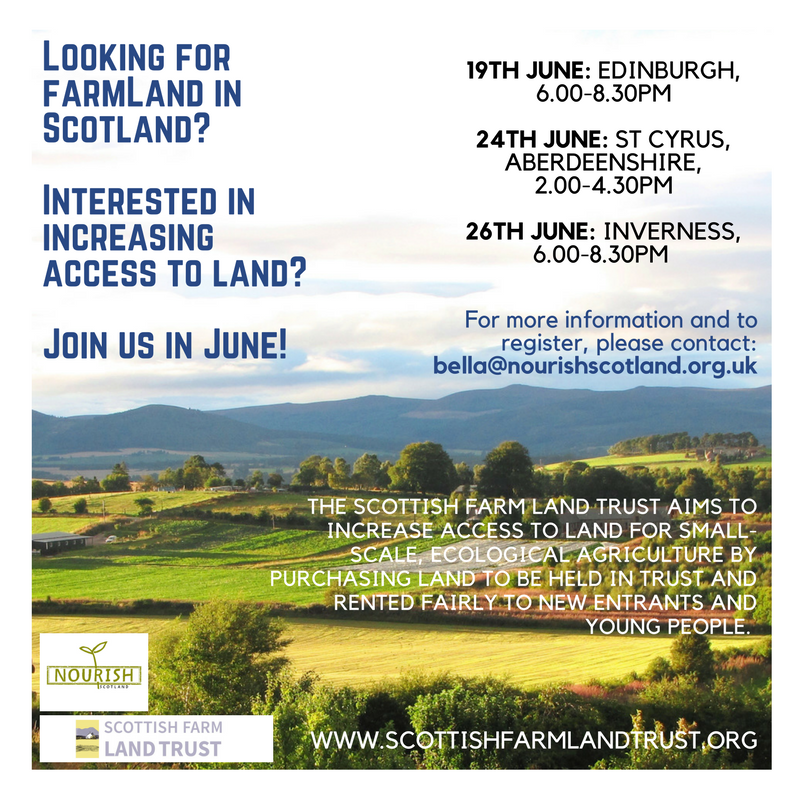 The events will also be a chance to share more about your situation, and feed in to the Scottish Farm Land Trust’s report on access to land, small-scale farming, and supporting ecological agriculture in Scotland. Please get in touch with Bella - bella@nourishscotland.org.uk, 0131 2261497, if you are interested in attending, or if you cannot attend an event, but would like to be involved. Looking for farm land in Scotland? We want to hear from you. 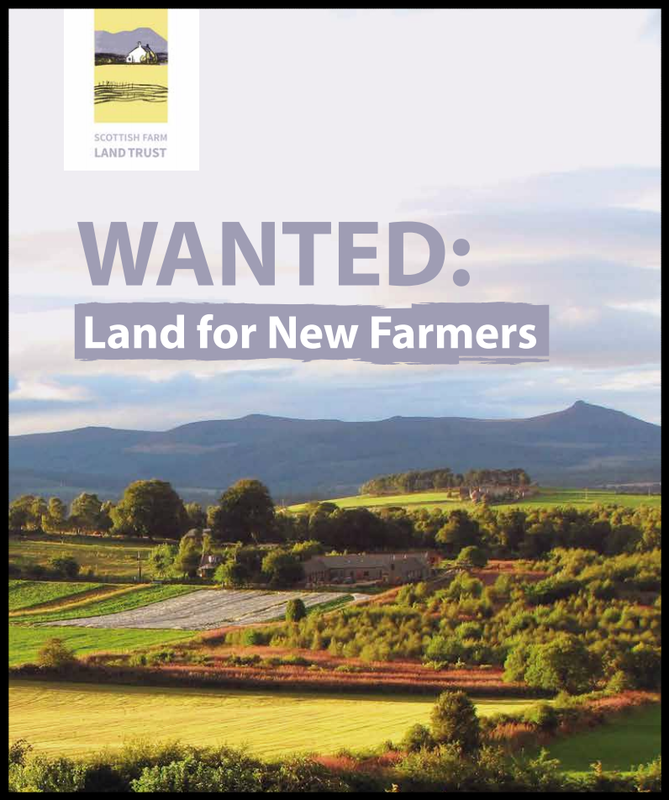 The Scottish Farm Land Trust (SFLT), in collaboration with Nourish Scotland, is undertaking a survey to find out who is looking for land in Scotland and what they want for it. Click here to fill out the survey. Our aim is to increase access to land for ecological agriculture, and we want to build SFLT as an organisation led by small-scale farmers, growers and new entrants. Fill out our survey to tell us if you have ever been looking for land, what you would do with it, what you think of our aims and what challenges you have faced. We want to hear from everyone who has even thought about looking for farmland so please pass this email on. 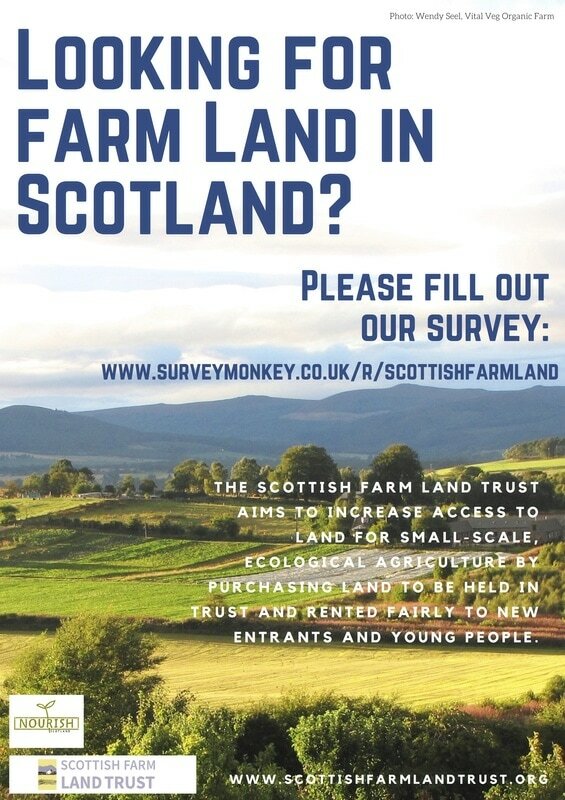 We will use the survey results to inform the development and strategy of SFLT, as an organisation to support new entrants and sustainable food production in Scotland. As you may be aware, we are due to start our feasibility study in December. We have chosen to team up with Nourish Scotland to carry out the study. Nourish are taking action at both the grass-roots level and the national legislative level of the food movement and have broad expertise in the food system, including access to land in Scotland. We are excited to be working with an organisation so passionate about ecological agriculture and changing how food is produced. Over the coming weeks we will be working on exactly how the feasibility study will take shape, and when we do, we’ll let you know how you can take part. In other news, we will be travelling to Germany in January as part of European knowledge-sharing project on access to land for ecological agriculture. We will be learning from organisations who have been in the business for years.